Join me and Audrey for the kick off to the holidays tomorrow night! 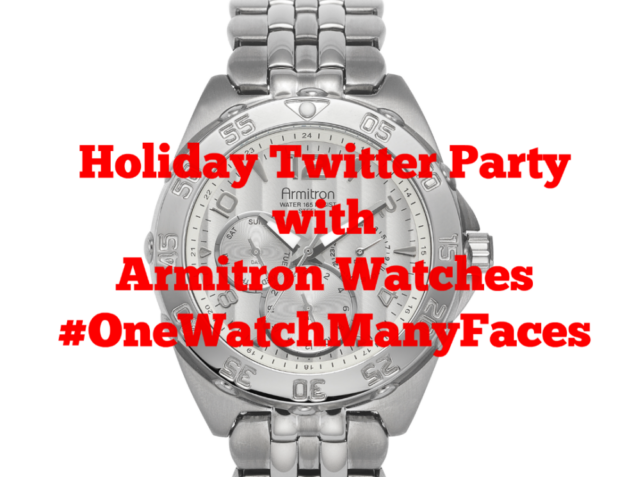 We’re hosting a fabulously fun Twitter Party with Armitron Watches that is sure to bring you some holiday cheer! Since 1956, Armitron has embodied and nurtured the spirit of individuality. Since pioneering many of the first affordable digital wrist watches, it has been Armitron’s mission to make stylish, functional timepieces accessible to every person. Today, Armitron looks to advance this mission by sharing the stories of real people. They are celebrating the eclectic, hard-working and diverse group of individuals that are their brand. Each of them with their own style, thoughts, and ambitions. These are the people who truly represent their brand. Armitron empowers each wearer to tell their own story through color, design, and functionality. A story not bound by borders or defined by demographics. A story of One Watch, with Many Faces. We’re excited to have you join us for a fun hour of holiday fun and style! (3) INCREDIBLE GIVEAWAYS throughout the hour!! !